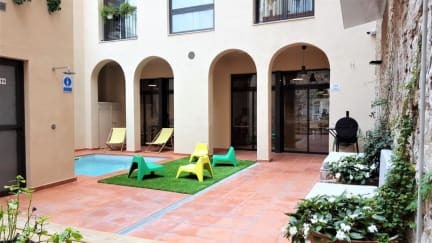 Ten To Go Hostel i Barcelona, Spanien : Boka nu! => between arrival date and 20 days prior to arrival date: 100% of the total amount penalty. 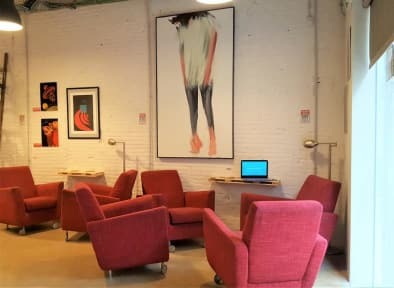 Ten To Go Hostel is located at the heart of the genuine and authentic Sants neighborhood, right next to Sants station, Barcelona's principal train station. From there, you will only be few stops away of all major Barcelona's tourist attractions, as well as all the outskirts such as Castelldefells beaches, the village of Vic and Sitges, Montserrat's monastery and many more! Ten to Go Hostel is a brand new hostel that offers amazing social areas, including a welcoming living room, a fully equiped kitchen, a computer's corner, a library and an awesome Meditteranean patio with an outdoor pool! Our shared dorms are very spacious offering X-large cosy bunk beds, with everything you'll need for a good night; high-quality mattresses and linen, individual table, lamps, plugs for devices and drawer, and individual curtains for privacy. Our common bathrooms also offer X-large showers with individual wardrobes. The facilities enjoy A/C in summer and heating in winter. And, most importantly, everything is clean! Welcome to Ten To Go Hostel! From 5:00 pm to 11:00 pm. Wish to check-in outside our opening schedules, contact us and enjoy our exclusive ONLINE CHECK-IN!! !